Image: sandsun/iStock Editorial/Getty Images Plus/Getty Images. 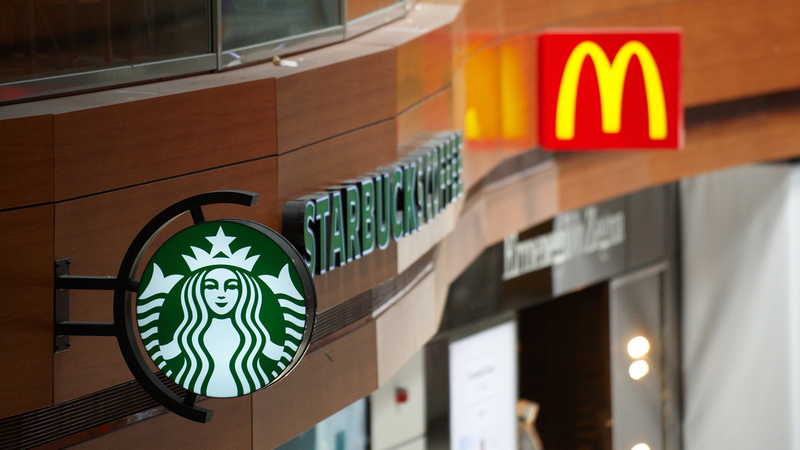 Who knew Starbucks and McDonald's would ever team up? It seems lately the world's two largest food and beverage retailers have been going head-to-head, particularly releasing new competing coffee drinks, but now they're joining forces for an amazing cause — one that'll help benefit our environment. McDonald's and Starbucks have joined together to develop a recyclable, compostable cup solution. This follows Starbucks' announcement to go strawless by 2020 and the goal McDonald's has of sourcing 100 percent of its guest packaging from renewable, recycled or certified sources by 2025. To give you a little background, Starbucks launched an initiative called the NextGen Cup Consortium and Challenge with investment platform Closed Loop Partners earlier this year, and NextGen's goal is to identify and commercialize the next generation of recyclable, compostable cups. "We are proud to come together with industry partners like McDonald's to drive innovative, scalable solutions for cup waste," said Colleen Chapman, vice president of global social impact focused on sustainability for Starbucks, in a press release. "A better cup will benefit the entire industry and we invite others to join us as we move these efforts forward." With McDonald's now on board as a founding member, the fast-food chain has announced it's committing $5 million in partnership with Closed Loop Partners to help launch the challenge, which now has a total of $10 million in funds. "McDonald's is committed to using our scale for good to make positive changes that impact our planet and the communities we serve," said Marion Gross, McDonald's senior vice president and chief supply chain officer, in the release. "We are excited to join Starbucks and Closed Loop to help solve this pressing challenge as collaboration is key to finding a scalable, lasting global solution." The challenge, which kicks off in September, invites entrepreneurs, industry experts, recyclers and innovators to submit their ideas for the next generation of recyclable and/or compostable cups — with a focus on fiber-based hot and cold cups, which is considered the most "significant challenge faced by the industry," according to the release. Up to seven chosen awardees will receive funding of up to $1 million and will enter a six-month accelerator program. According to the executive director of the Center for the Circular Economy at Closed Loop Partners, Kate Daly, they have received more than 1,000 inquiries from companies and individuals interested in participating in the challenge. "We are working with consortium members to build a robust shared set of technical, performance and environmental criteria that we will announce later this summer," she says. According to Fast Company, McDonald's and Starbucks combined distribute 4 percent of the world's 600 billion cups annually. Through this challenge and this partnership, they aim to help divert said billions of cups globally from landfills. "There has never been a greater need to tackle the ways in which we source and recover materials," said Erin Simon, director of sustainability research and development and material science at World Wildlife Fund. "McDonald's participation is a strong step forward in building momentum from major brands to come together and develop innovative approaches to materials waste. Working together across the entire value chain of these major companies will allow us to create a comprehensive and lasting solution to this critical conservation challenge."